Higher Juice Yield and Drier Pulp - Auto pulp-ejection for continuous operation. Easy to Clean - Easy to assemble, operate, and clean, dishwasher safe; runs quietly, below 65 decibel. Broad spectrum juicer accommodates fibrous vegetables (celery, ginger), wheatgrass, barley grass and other leafy greens, apples and other fruits. 2 years warranty. 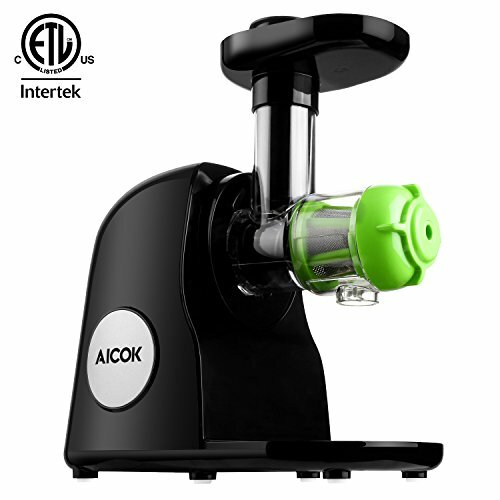 The Aicok Slow Juicer is the right choice for the health-conscious individuals who want greater variety in their daily juicing routine. It employs a low speed masticating technology for minimal heat build-up and oxidation and provides juice that is richer in healthy enzymes and vitamins. Reverse Function: pushes down “R” switch to prevent clogging. Because juicer equips with DC motor, so there will be a short delay when it power.It is a Motor protection system.